Nespresso vs Keurig Comparison Which Brewer is Best ? 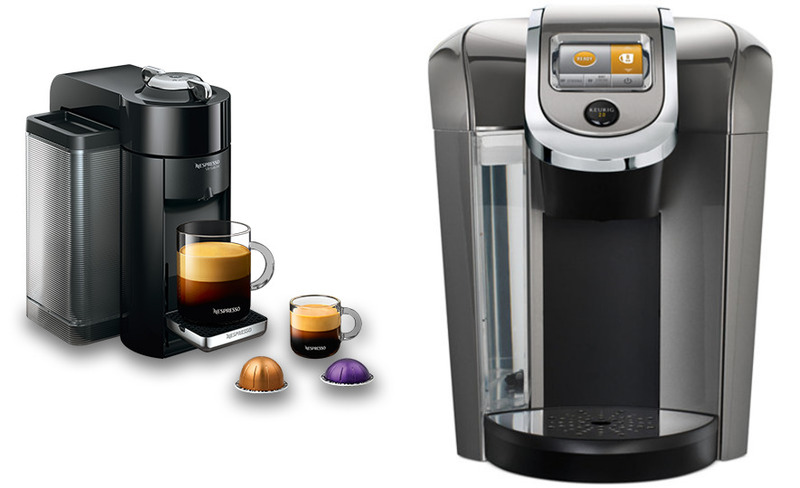 Nespresso vs Keurig which coffee maker is the right choice for your kitchen? Most of us simply wouldn’t be able to function without our morning cup of Joe, which makes brewing your favorite coffee at home the go-to option. Single-serving coffee makers have become especially popular, since they’re so fast and easy to use. Getting that first caffeine hit first thing in the morning is a sure fire way to start your day off right and getting it quickly is paramount. In the battle for single serve coffee makers it comes down to Nespresso vs Keurig. Which single serve coffee maker is right for you? Two brands stand out as the at-home coffee maker of choice: Keurig and Nespresso. If you are looking to upgrade your old drip coffee machine and have decided on a single serve pod brewer then the two heavy hitter are undoubtedly Keurig and Nespresso. Both brew systems are the most convenient way to get your hit first thing in the morning, quickly and with minimal clean up they really are a big time saver. If you are in a rush and don't have time to read the rest of this article then the one to get is the Nespresso. Nespresso offer a much better taste experience than the Keurig brewers and are built to a much higher standard. Ultimately the difference between both brands is that the Nespresso gives you a very high quality espresso experience but is fairly limited to that. Better coffee taste, quality and consistency. High quality components used throughout. Keurig burst on the scene back in 1998, with a revolutionary new concept that has quickly become de rigueur for so many coffee lovers at home: an easy, single-serving coffee ground pod that the machine transforms into a single cup at a time. Nespresso was developed back in 1976 and the capsules were first patented in 1996. This Swiss brand develops high-quality machines that create many high-end coffee drinks. Lets take a look at the two best mid-range models from each manufacturer the Nespresso Evoluo and the Keurig K575. The Evoluo from Nespresso is one of the most popular capsule based home espresso makers ever released. The Evoluo produces one of the best crema's you will ever find from a capsule based brewer. 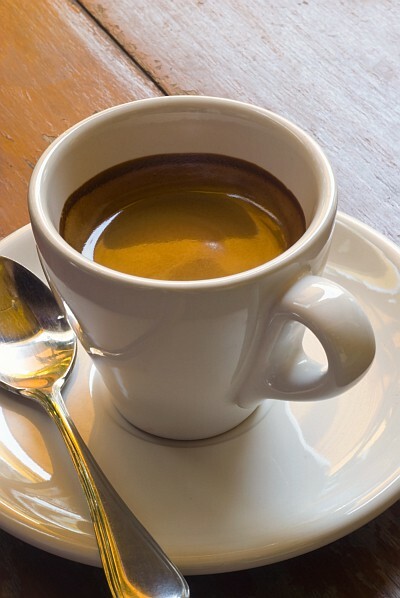 That crema is produced by what Nespresso call their "Centrifusion" brewer technology. The Evoluo uses the newer style Vertuoline capsules. Each capsule has a barcode printed on the side of it. It has a 40 ounce reservoir that is easy to access and can accept two different sizes of capsules. The Keurig K575 is more a brew station than an espresso machine like the Nespresso above. There is also a water on demand feature should you need to top up your coffee with hot water at any stage.​ There is also a water filter kit included which can save you from having a separate water filter. Nespresso vs Keurig how do they stack up against each other ? Coffee maker design is one of its stand-out feature, and it’s the one that most buyers look for when you’re shopping for a new one. A coffee maker sits out on a counter and is visible at all times. So, its design should be one that’s attractive enough to be seen, fits well on a cluttered countertop while competing with other small appliances. It should also contain all of its moving parts, has enough space to fit a coffee mug comfortably, its water tanks can be refilled easily, and it’s something that you’ll really enjoy using. While aesthetics are only one part of the overall design of a coffee maker, between these two brands of Nespresso and Keurig, you can definitely compare the two. Keurig coffee makers have become pretty ubiquitous at many offices and homes. Their design is much more functional than attractive. They’re large machines when compared to many of the Nespresso ones, and that’s because of the water tank sizes. These machines were designed so that you could pour up to 48 ounces of water into the reservoir without having to refill it. They are also designed with a large tray for a cup to sit on, and they’re high enough so that you can have up to a 10 oz. coffee mug beneath the K-pod. With Keurig machines, the K-cup holder is above the drip tray. There’s a button function group next to the K-cup mechanism, which contains all of the controls to power the machine. The water reservoir is accessed on the left hand side of the machine for ease of use. Keurigs are bulky small appliances and take up a lot of space on a countertop. You’re advised to measure your kitchen before purchasing one, as some buyers have complained that they don’t fit underneath standard cupboard heights. Keurig machines are, on average, between 14” and 16” tall. However, you also need to factor in an extra 3” in height in order to open the top and insert a K-cup. The water reservoir access is also poorly designed. You have to pull the machine from underneath a cupboard to access the reservoir, since it has to be lifted straight up and out. The tank is very narrow and hard to fit underneath most sink faucets, which makes office use challenging. Some Keurig models do offer the ability to insert a water filter, though. While the drip tray is removable, it’s far too high and unnecessarily elevates the coffee mug. While you can have different K-cup sizes, the way the machine is designed, you can only have one at a time. Keurig machines are made in China. They’re not as durable as Nespresso machines, because their parts aren’t as high quality. This contributes to a lower cost, but also a higher degree of turnover. Many Keurig users note that their machines don’t even last two years. The overall design of the product line machines is much more handsome than even the most top-of-the-line Keurig. These Nespresso coffee makers are ones that you’ll be glad to have on your counter. There are two main models, called the OriginalLine and the VertuoLine, plus a few other single designs. Each one is very attractive and looks almost like a retro ice cream maker or milkshake machine. These machines are designed much smaller than a Keurig. The Nespresso VertuoLine is less than 12” tall, so they will fit into any kitchen and look good sitting on your countertop. The drip tray is not too tall and is nice and rounded in the front. The water tank is much smaller than a Keurig, so you’ll have to refill it more frequently; it sits on the left-hand side of the machine. The top of the machine contains a lever to lock and unlock the top, the control button, the pod container, and a control button. One cool feature is that after use, the top of the machine automatically ejects the pod. Nespresso machines are made in Europe, since this is a Swiss company. They’re more expensive than Keurig’s, but that’s because they’re built to last. With proper care and cleaning, your Nespresso should last for at least five years or more. Yes, having a cool design is great, but what about taste? Even if you’re not a self-described ‘coffee snob,’ you don’t want to be cheap tasting coffee every morning, either. That will just tempt you to swing by Starbucks. So, this is definitely the most important category. Both the Keurig and the Nespresso have pros and cons in this category. The Keurig offers much more flavor variety and the convenience of finding flavors, while the Nespresso offers better taste. 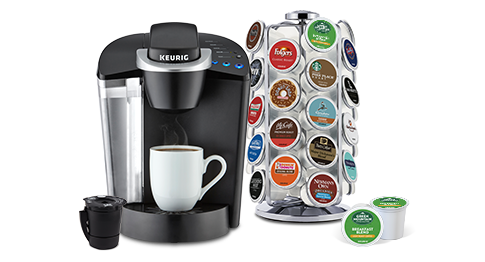 If you’re the type of coffee drinker who loves to try a new flavor every morning, the Keurig is your perfect machine. It can take a much greater variety of flavors than the Nespresso, including coffee and tea. Plus, K-cups can be found at grocery stores and large retailers like Amazon, Walmart, and Target. K-cups are also compatible with any Keurig design model. You can purchase a separate refillable K-cup to use your own ground beans, so you’re not limited by any flavor. K-cups are now even being offered in iced drinks, and the flavor selection expands with every passing year. There’s also name-brand K-cups like Starbucks and Dunkin’ Donuts. When it comes to actual taste, though, many Keurig users have complained that flavor quality is sacrificed for convenience. You’ll get a good cup of coffee, but it’s not as good when compared to a regular drip coffee maker or a French press. Sometimes, it can even taste watery and too thin. 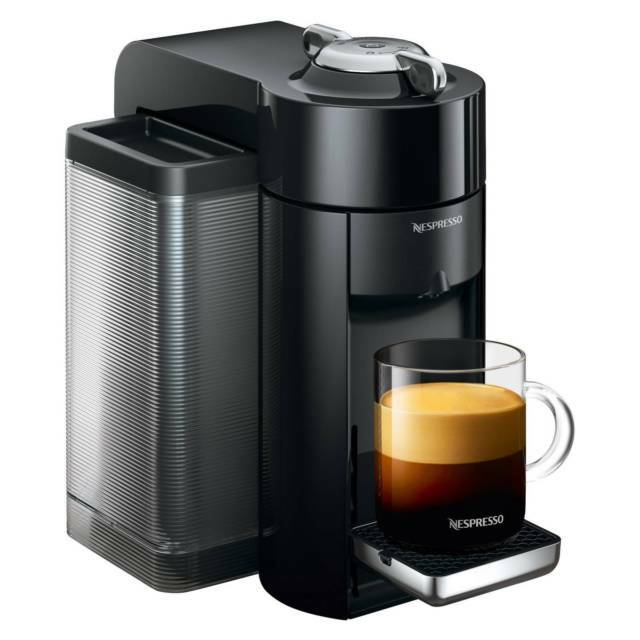 The Nespresso is designed solely for coffee flavors, so this is not a tea machine. You have to purchase specific Nespresso pods, which are not sold in as many locations as K-cups and are not compatible with the Keurig. There’s definitely not as much of a selection for coffee flavors, so you’re limited to what the company offers. Also, you have to pay attention to the capsules you’re purchasing, because Nespresso OriginalLine capsules and VertoLine dome-shaped pods are not compatible with each other’s machines. This is a huge negative, since that makes it much less cost effective and convenient. 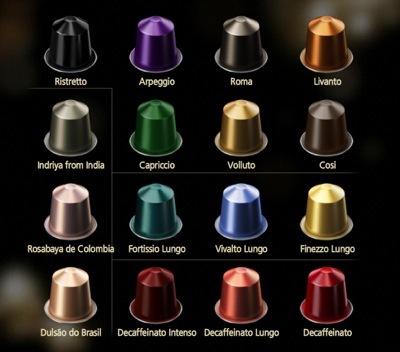 If you’ve bought a Nespresso OriginalLine, you’re limited to only those capsule flavors. 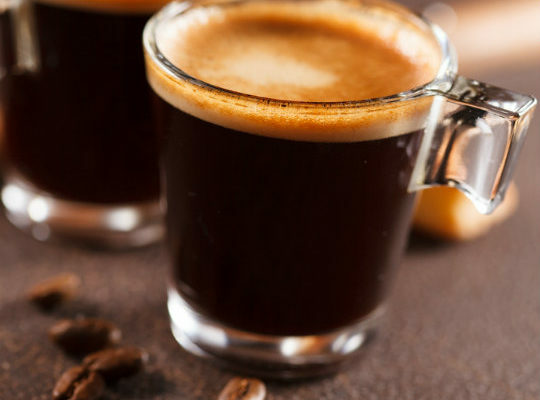 Despite the negatives for flavor variety and capsule compatibility, the Nespresso definitely delivers on a delicious, smooth, full-bodied taste. Nespresso users rave about the high quality and how it tastes like it comes from a much more expensive espresso machine. The crema is good, too. A cup of coffee from the Nespresso will taste more like it came from a high end coffee shop. The OriginalLine is only an espresso machine, while the VertuoLine offers both espresso and coffee. Whichever model you choose, they both make an excellent cup of coffee. It doesn’t get much easier to get a cup of coffee from either the Nespresso or the Keurig. In this category, they’re tied. Both machines are very simple and easy to use within minutes of set up. That’s the great advantage of single-use coffee makers. You can use them quickly and simply during busy mornings. It only takes a couple of minutes for them to preheat, then you simply press the button to start, and the coffee starts pouring. Both machines also have automatic shut-off features. Neither machine is particularly loud during operation. The Keurig has become famous and popular based on its ease of use. On the top of the Keurig are all of the control buttons for choosing cup size, start, stop, and descaling. There’s a handle to open the top to insert a K-cup. Once you’ve put the K-cup in and closed it, it heats up the water, then starts pouring. To operate the Nespresso is even easier. There is a single coffee button on top of the machine that has all of the controls, including preheating, starting, pausing, stopping, and descaling. It also has a lever to open the top. Since both of these machines are one-touch and simple, one feature they both lack is the ability to control the temperature. There’s no additional options about changing the flavor’s strength, either. When it comes to refilling the water reservoir, neither machine is particularly convenient. The Keurig is probably the more difficult one to refill, since the tank is very large and unwieldy. The Nespresso water reservoir is not easy to refill either, because it’s narrow at the top. What about cleaning? Both machines are easy to descale and keep clean. They have drip trays that need to be wiped down and water tanks to clean. They each come with a descaling feature that helps keep the water fresh. When comparing coffee maker costs to coffee shop costs, there are quite a few factors involved. Paying at least $5 for a morning latte, compared to $0.60 for a K-cup is definitely more expensive. When it comes to overall costs, the Keurig wins this battle hands down. Even their most high end model is much less expensive than a Nespresso. The K-cups also cost less than the Nespresso pods and can be purchased in bulk sizes to further reduce the costs. Also, you can get a refillable K-cup and save even more money by purchasing ground coffee or grinding it yourself. The Nespresso’s expenses are certainly below what you would pay when purchasing coffee shop lattes or cappuccinos, but it is more expensive than the Keurig. It is more expensive than the Keurig and the coffee pods are more expensive. However, if you would like to purchase an espresso maker that’s a lot less expensive than other espresso makers, the Nespresso is a top choice. With a Nespresso, you might want to purchase additional items like a milk frother (called the Aeroccino), and the Keurig doesn’t offer any accessories like that. In the world of single-serving coffee makers, both the Nespresso and the Keurig are stand out winners. Which one is better for you? Let’s look at the winners of each category. Each gets a score of three, so they’re tied. As for which one is best for you, that’s up to your individual taste, preference, and budget. But, whichever one you decide to choose, your coffee will have a great flavor and be ready in moments. Personally I would always choose the machine that gives the highest quality flavor profile and that is found in the Nespresso range of brewers.